Throughout history, the palaces of the rich and royal have thrilled visitors with their opulence and ostentation. We discover ten of the world’s most beautiful residences, each enchanting with their own architectural style, exquisite design and incredible stories to capture the imagination. What: Built between 1749 and 1764 as a summer playground for the imperial families of the Qing Dynasty, this masterpiece of Chinese landscape garden design encompasses 3000 man-made constructions of ancient pavilions, towers and bridges. The original palace was destroyed in the Second Opium War of 1860 and rebuilt in 1886. In 1888, it was given its current name, Yihe Yuan, and served as the cherished home of the Empress Dowager Cixi. What to see: Covering 300 hectares, this is the largest and best-preserved imperial garden inChina; its name Yi He Yuan translates as ‘Garden of Restful Peace’. Star attractions include the imposing Hall of Benevolence and Longevity with its own courtyard garden, and the 728-metre Long Corridor, a unique art gallery showcasing 14,000 intricate paintings of landscapes, flowers, birds and Chinese mythical scenes. Most iconic is the 36-metre long Marble Boat, a lakeside pavilion built entirely in white stone in 1755 during the reign of Emperor Qianlong and restored by the Empress Dowager in 1888. What: Translated as ‘Filled Garden’, Dolmabahce Palace was commissioned by Ottoman Sultan AbdÃ¼lmecid I as an imperial pleasure palace to surpass any other in Europe. Built between 1843 and 1856, architects Garabet and Nikogos Balyan were given complete design freedom and an unlimited budget. Using Baroque, Rococo and Neoclassical styles blended with traditional Ottoman architecture, the result is an ostentatious creation with 285 rooms, six galleries, four grand salons and six Turkish baths, one of which is made from carved alabaster marble. Six tons of silver, 14 tons of gold and an endless supply of Baccarat, Bohemian and Venetian glass were used in the construction process. What to see: Each of the sumptuously-appointed chambers exudes opulence, especially the glittering Ceremonial Chamber (Throne Room) with its colossal 4.5 ton Bohemian crystal chandelier lit by 750 electric lights. To emphasise the splendour of the Empire, the decor was flamboyant; walls were covered in rare paintings and objects d’art fromEurope and theFar East, ceilings were lavished with gold and Hereke silk and wool carpets were spread over ornate wooden floors. What: Magnificently located on the bank of theNevaRiver, this three-story Elizabethan Baroque-style palace was the official residence of the Russian Tsars from 1762 till February 1917 when the ruling dynasty was overthrown in the wake of the revolution. The Winter Palace was commissioned by the daughter of Peter the Great, Empress Elizabeth Petrovna, in 1754, yet she did not live to see its completion. Designed by Italian-born architect Francesco Bartolomeo Rastrelli, it is now part of the State Hermitage Museum and houses over three million works of art including 23 Rembrandts, 37 Matisses, 31 Picassos and two Leonardos. What to see: The lavish facade of this immense apple-green, white and gold 1,001-room former royal residence has remained almost completely unaltered, impressing with a confection of arches, columns, balustrades and pavilion-annexes. The majestic State Rooms on the first floor are swathed in gilded mirrors, malachite and agate; most spectacular are the Hall of St. George, the palace’s main throne room, and Armorial Hall with its ornate chandeliers and large stucco warriors. What: Originally a hunting lodge built by Louis XIII in 1624, this salubrious palace – also known as Chateau de Versailles – was expanded by his son Louis XIV in 1669 and used as a secret refuge for trysts with his mistress Louise de la Valliere. Under the direction of Baroque architect Jules Hardouin Mansart, the ChÃ¢teau soon became an icon of artistic triumph complete with landscaped gardens and extravagantly gilded Petits and Grands Apartments. Each of the three kings who lived here until the French Revolution in 1789 commissioned architects and artists to enhance its eminence. What to see: Exuding luxuriousness, the palace features 700 rooms, 2000 windows, 1,250 fireplaces, 67 staircases and over 1,800 acres of enchanting parkland. Most famous is Chambre de la Reine, Marie Antoinette’s opulent bedchamber with its giant gilded bed draped in luscious heavy silks embroidered with flowers, peacock feathers and lilac branches. Also remarkable is the shimmering 240-foot chandeliered Hall of Mirrors, named for the 357 beveled mirrors lining its 17 arches – the Treaty of Versailles was signed here on 28 June 1919. What: Set on Marpo Ri Hill, or Red Hill, 130 metres above the Lhasa Valley at an altitude of 3,700m, nine-storey Ptoala Palace is the highest palace in the world. Originally built by Tibet King Songtsen Gampo to greet his bride, Princess Wen Cheng of China’s Tang Dynasty in 637 AD, it was rebuilt by the Fifth Dalai Lama in 1645. 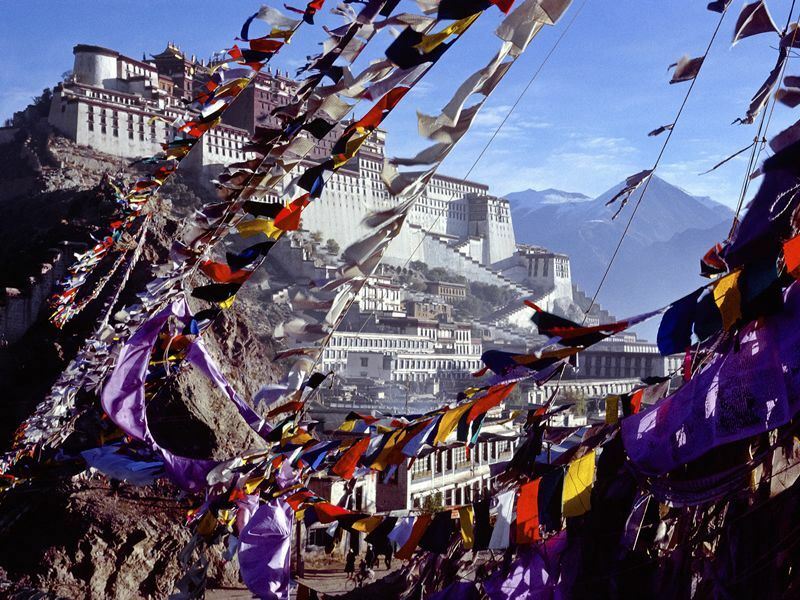 It since became the seat of Dalai Lamas until the 14th Dalai Lama fled to India during the Tibetan uprising against the invading Chinese in 1959. Now a government-owned museum, the stone-and-wood structure has 1,000 rooms, 10,000 shrines and 200,000 statues. What to see: The complex is made up of two palaces; White Palace and Red Palace. The secular White Palace was the living quarters of the Dalai Lama and also housed the seminary for training Tibetan government officials and the printing house. The Red Palace is devoted to religious study and houses richly-painted halls, shrines, chapels and libraries containing Tibetan Buddhist scriptures. Most fabulous are the bejeweled rooms containing the gold-covered tombs of eight Dalai Lamas. What: Completed in 1968 within the grounds of what was Edo Castle, this two-storey structure known as Kouko is the residence of the Japanese royal family – it is currently home to Emperor Akihito, 125th Emperor of Japan. Surrounded by a water-filled moat, the inner grounds are off-limits to visitors and only open to the public twice a year on January 2 and December 23, the Emperor’s birthday. This is when the adoring masses can catch a glimpse of the Imperial Family on the balcony. Guided interior palace tours are offered, but must be reserved months in advance. What to see: The awe-inspiring Kokyo Higashi Gyoen, known as the East Garden, is open to the public throughout the year except on Mondays, Fridays and special occasions. Set in these grounds is Ninomaru, a soothing Japanese-styled garden with winding paths, stepping stones and seasonal blooms, and The Museum of the Imperial Collections, a showcase of 8,000 artworks belonging to the Japanese royals. The smaller Kitanomaru Gardens houses the Science Museum, National Museum of Modern Art and Nippon Bodokan, a martial arts arena. What: Set on a rocky ridge above the town of Sintra, 30km west of Lisbon, Pena National Palace defines the skyline with its fairytale-like facade and huge conical chimneys. Built 500 metres above sea level, the 12th century building was originally a chapel dedicated to Our Lady of Pena. Destroyed by the Great Lisbon Earthquake of 1755, the site remained abandoned until 1838 when it was purchased by King Fernando of Saxe-Coburgo-Gotha. Designed by Ludwig von Eschwege, who used an eclectic mix of Gothic, Moorish, Egyptian, Islamic and Renaissance architectural styles, the palace was completed in 1852 and used as a royal summer residence. What to see: Fanciful rooms and halls are furnished with royal collections of decorative arts, amazing stuccos, hand-crafted tiles and frescoed ceilings – the most grandiose is Blazons Hall with its domed ceiling bearing the coats of arms of 72 Portuguese royal families. The palace gardens are equally as thrilling; known as Pena Park this 200 hectare area is filled with over 2,000 species of plants and exotic flora from former Portuguese colonies. What: Created for military purposes in 1238 by Ibn el-Ahmar, the first king of the Nasrids, the Alhambra (taken from the Arabic meaning Red Castle) is a Moorish masterpiece and one of Europe’s greatest architectural sites. Part royal residence, part fortress and part city, this mighty complex is set against the backdrop of the Sierra Nevada mountain range. Measuring almost 26 acres, it incorporates the triangular Alcazaba (citadel) that dates from the 9th century and the Nasrid Palaces – three interconnecting palaces built in the 14th century by the Nasrid kings. What to see: The jewel of the Alhambra is Palacios Nazaraes, also known as Casa Real (Royal Palace) which houses ceremonial rooms, royal offices, private quarters and courtyards. Built chiefly by Yusuf I and his son Mohammed V, this is one of the world’s most fabulous Islamic buildings. Walls are decorated with elaborately carved inscriptions from the Koran, intricately designed tiles, lacelike stucco and ornamental stalactites. Other highlights include the Palace of the Lions and Chamber of Comares. What: Dating back to the 14th century when it was part of the Klosterneuburg monastery, this exuberant palace was purchased by the Habsburgs in 1569. Designed by Austrian architect Johann Bernhard Fischer von Erlach in 1696, it was later altered in the 18th century by the Empress Maria Therese, the mother of Marie Antoinette. Maria Theresa’s consort, Emperor Franz Stephan of Lorraine, installed the famous Baroque-style menagerie in the sculptured palace gardens in 1752 — it is now known as the world’s oldest zoo. What to see: This cultural treasure attracts with 1,441 public rooms and apartments with superb Rococo-style interiors, 40 of which are open to visitors. Most dazzling is the Hall of Mirrors where the walls are covered with ornate crystal mirrors in gilded frames; Mozart played here for the Empress when he was six years old. The Great Gallery, decorated with stucco ornamentation and ceiling frescoes painted by Italian artist Gregorio Guglielmi, was the setting of glittering banquets, ceremonial balls and court receptions held throughout Maria Therese’s 40-year reign. 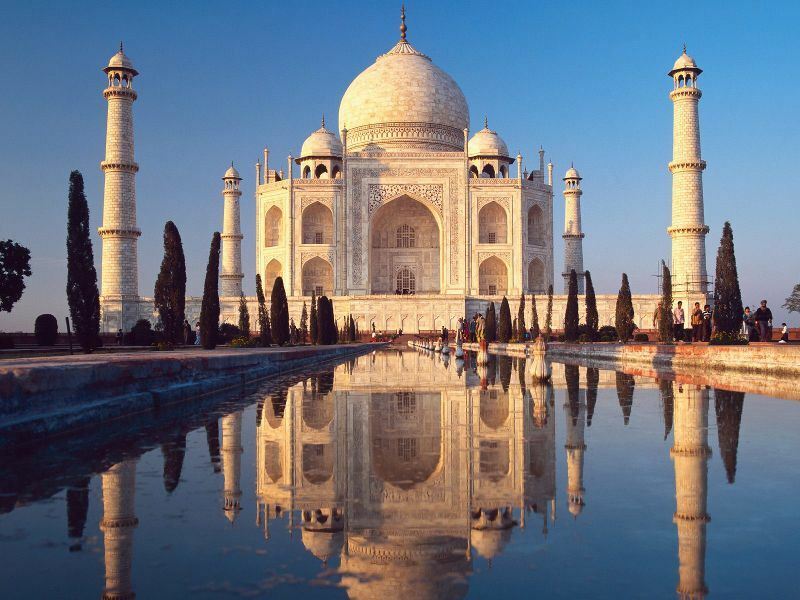 What: Looming from the banks of the Yamuna River, the Taj Mahal (meaning Crown Palace) is India’s most iconic monument, ranking as one of the world’s Seven Wonders. Located around 200 km south ofNew Delhi, this glistening white marble structure was built by the Mughal Emperor Shah Jahan in memory of his beloved wife Mumtaz Mahal who died in childbirth in 1631. Legend states that the Mughal Empress had bound her devoted husband with a deathbed promise – to build her the most breathtakingly beautiful tomb ever. Construction began in the year of her death; approximately 20,000 labourers from all over the world were employed under a team of master architects to create a compelling and symmetrical fairytale-like palace structure. Costing approximately 32 million rupees, this epic task took 22 years and was finally completed in 1653. It is alleged that on its completion, Shah Jahan ordered the right hand of the chief architect to be cut off so that the he could never again build anything as beautiful as the Taj Mahal. Today, it is one of the world’s most celebrated structures; a symbol ofIndia’s rich history and the crowning jewel of Indo-Islamic architecture. What to see: Regarded as a symbol of true love, the building was carved from Makrana white marble and assumes variations of tint and tone depending on the time of day. It tends to be tinged with pearly pink hues at dawn, shades of brilliant white atmidday and shimmering gold by moonlight; many believe that this changing colour pattern depicts the different moods of a woman. The structure is topped by a huge white marble terrace on which rests the huge bulbous dome which is flanked by four detached minarets. The double-storied domed chamber houses the star attraction; the exquisite white marble cenotaphs of Mumtaz Mahal and Shah Jahan which are elegantly carved and inlaid with precious and semiprecious stones. The actual bodies of Shah Jahan and Mumtaz Mahal are buried beneath their cenotaphs in a lower chamber. The complex is set around a 300-metre squared Persian-style garden, again based on symmetry. Using stone-paved raised pathways, it is divided into four sections — the number four is considered the holiest number in Islam. Designed to evoke the sense of Islamic Paradise where rivers of water, wine, milk and honey flow, there are 16 flowerbeds in each quarter section, each with 400 plants. The centrepiece of the garden is a raised marble lotus-tank known as ‘Tank of Abundance’ which reflects the image of the Taj Mahal in its waters.